By any measure, Google TV has been a failure. In fact, I’d say they’re not even in the game. And no company has paid the price more than Logitech with their bad bet on Google’s initial foray into the living room. Just how bad has it been? More Logitech Revue hardware was returned in the second quarter than was actually purchased. Ouch. I’m sure both Google and Logitech shoulder their fair share of blame – neither did an effective job explaining the unique benefits of this product or platform. But the software experience failings themselves are on Google. At $250 or $300, as originally priced, there are very few people I could (or did) recommend the Revue too. However, as of today, the Logitech Revue is now merely a hundred bucks. And its capabilities and shortcomings look much different at this price point… First off, in my experience, Google TV offers the very best television-based web browsing experience. Neverminding for a moment those blocked sites. Next, while the Google TV platform has remained relatively stagnant and most “apps” are actually just reformatted webpages, you’ve got access to core services similar to what’s found find competing platforms in this range – like the new Roku 2. In fact, I’d say Netflix, Amazon VOD, Pandora, and YouTube make the Revue fairly well rounded. Pulling it all together is the full-on wireless QWERTY keyboard… which ran $99 until last week. So now you get Logitech’s complete Google TV experience for the price of the keyboard. Of course, it’s not entirely clear how committed Logitech will remain to this product or Google TV in general given the massive hemorrhaging. But if they deliver the marketplace-powered Android Honeycomb Google TV update this summer, as promised, it’s a whole new ballgame. I am tempted to buy one of these since I have $20 to Best Buy that expires next week. I just can’t think of a real use for it. Amazon doesn’t have the lower price yet. Bestbuy has it, but charges tax+shipping. The best deal I could find was direct from Logitech. They charged me tax, but shipped free. Well I don’t have a use for it either, since I have a highpowered HTPC running boxee, XBMC, and huludesktop. $99 just happens to be my “oh what the heck” toy threshold. And who knows, maybe the honeycomb update will render it actually useful! At this price point I think the Revue is a neat item, but I already have a Tivo Premiere. Is there any benefit trying to integrate the two? Will they even work together? I think at 99 it’s almost a no brainer. I guess the only question is there anything about the hardware right now that would make no work will with future google tv updates/features? I mean I suppose the next revisions of google TV would also be around this price point when if they come out. I guess the question is will there be any hardware features that may be included in the next version that are worth waiting for…. For the $99 price these things will stick around for a while. I don’t intend on buying one until the Honeycomb update arrives, that way I don’t get burned. Also, I’m kind of eager to see if there are any newer standalone GoogleTV boxes that will arrive with the Honeycomb release. Now they will have to be priced in the $100 range as well. google should get this integrated into TVs and blu-ray players from samsung, sony, panasonic, and LG. Or make a standalone DVR with tuner. Basically some sort of additional added value that pushes the tech forward. The adoption would go through the roof and it would have added utility of being a TV/blu-ray player/etc. The problem for me is that I already have this functionality covered between my existing Panasonic HDTV, game system, and computer so there’s little reason for me to buy it (even at this price). $99 isn’t bad for use as a SlingCatcher..
Yeah, amazon was out of stock so it only showed resellers. They promised that all the 1st gen googletv devices would get the honeycomb update. After that, of course, who can tell? 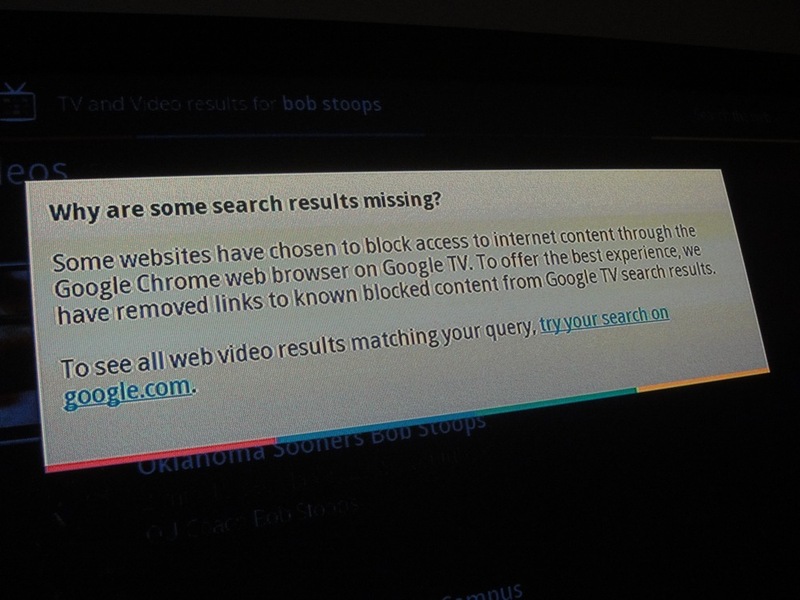 In its current form, the googletv is by far the best 10ft web browser. It’s also got a decent netflix app, but that’s duplicated everywhere. Even at $99, for streaming internet video, I’d certainly get a Roku2 over the googletv. As a toy, though, it can’t be beat. Well, I’d buy one but no payment works right now. sparced, Google TV is integrated into 4 Sony televisions and a Blu-ray player. But I don’t think sales have been stellar. I actually considered the 32″ or 40″ for our new bedroom television, but until/if it gets Honeycomb with the Market I’m not gambling. Not to mention my current “smart TV” is a Vizio that has a problem rebooting and takes too long to come up. Not interesting. I ordered one today. I have been this close to picking up a Roku for a while now, and once this dropped to $99, it was a no brainer. Once it gets Honeycomb, it will eclipse anything the Roku can do. Plus it has an awesome, full keyboard. Easy decision for me. Can these be used to stream local content? It IS a nice concept and I have had one since prior to launch but I’ll say one thing that rang home once again last night. It was just the REBOOTS and the CRASHES, and the FALSE OPENINGS of applications. Try to launch pandora, LITERALLY half the time I get NETFLIX. Try to switch channels on pandora, I get crash, “this application is not responding” force quit, etc. this is pretty endemic of problems and I really wish the product was simply more responsive and reliable. Finally at 100$, for people who buy it and have this experience it won’t be as much of a failure or waste. I pre-ordered the Logitech Revu when they first offered it. After delivery I used it but felt that it just didn’t integrate enough with DirecTV enough to make it seamless and have the ability to drop the use of the DirecTV remote and using the DireTV menu and guide. The one thing that the Revut offered and appealed to me was the ability to play videos that you may have on another computer. The one downside was (was still may be) that you had to run a DLNA server on a machine that you have the videos on. Before 30 days were up I returned it. I then purchased the Boxee Box. While this still doesn’t have the integration I would like, all of the other features it does have blow the Revue out of the water. With the Boxee Box you do not have to run a DLNA server. Just share a drive on your network, point the Boxee Box to the location and you can play the video. Ryaninc, that’s pretty risky, hoping that a future update will provide those features when it’s still in NDA beta and nobody knows what it actually includes. If you want to stream right now, get a roku. If you want to play local media with light streaming, get a boxee box. If you want to play around with browsing at 10′ and/or blow $100 on a toy that you may never actually find a use for (like me!) get the googletv. It is a pretty awesome keyboard remote. If the googletv remains sucky, I plan on getting a “logitech unifying receiver” and using it for my HTPC. Supposedly it works great in linux too. @ryaninc – “eclipse” sounds awesome! @Dave Zatz Your Vizio TV maybe at firmware version C3.2.3_RC3. TVs shipped from factory right now are coming with C5.1.3_RC0. All the internet-connected Vizio TVs I have seen with your firmware version and prior have this rebooting issue. The updated firmware version appears to resolve the issue. It should be released OTA soon. It’s amusing and disheartening to see all the online complaints and users trying to isolate the problem down to a particular variable. It’s definitely software related for the majority of problem cases and I hope a class action lawsuit is brought against Vizio for its negligence, lack of communication, and complete failure to address the issue with an adequate time frame. Summer 2011 officially runs June 21 – Sept 22nd. Course that’s not the answer most people would consider correct. I assume most people think summer ends with the Labor Day barbeque or when the kids go back to school. Also, it wouldn’t be at all suprising if the update didn’t come off as expected, potentially through no fault of Logitech’s, since obviously Google is doing some retargetting if they’re working on Google TV anymore at all. I presume that any new version of Google TV will run on ARM rather than Intel CPUs, will have different keyboards, will hook up differently, perhaps use a different remote, etc. All of which has the potential to break compatibility with the (limited) stuff that they’ve already shipped. I wouldn’t go near one of these things as it stands. Just buy a Boxee or Roku box or wait. From what I’ve read, the fishtank devkits still run the same intel atom architecture, but include a coax cable, maybe for MoCA. Remember boxee planned to use tegra2 (which is ARM with NV’s graphics tech) but it was too slow. So the next version of googletv be waiting on kal-el. The Revue unit is actually pretty good, but flawed. My favorite aspect is how you can take the HDMI from your TiVo or cable or sat box and have the Google TV features overlay or swith with its video feed. Greg, yes, it does integrate with TiVo. It has a TV browser. (This is also one of the flaws as it requires the use of its trackpad device to navigate. Spatial navigation is only available on sites specifically designed for GoogleTV, which is too bad. It would have been a much better product if they’d developed spatial navigation to work for every website. Other advantages are that the apps are better than their TiVo counterparts. On the TiVo, navigating your queue is a pain and you can’t add to it from the TiVo. You can do that on GoogleTV. It’s other interfaces are also better than their TiVo counterparts. Assuming Logitech hangs around, there will be upgrades with Google TV apps. That’s when the product will get interesting. The Revue was a decent product but overpriced. I’m glad Zatz brought it up again as at $99 it deserves another look. I’m holding out hope for GoogleTV, especially in light of Google’s June purchase of SageTV. I’m just speculating but I have a hard time making sense of this purchase unless Google is planning to embed DVR capabilities into future GoogleTV products — as an alternative to dealing with DVR partners (such as Dish, DirecTV, TiVO, etc). Regardless, I’m not sure the GoogleTV v1 products will ever be capable of such functionality. Want web browser for international content… Wondering if browser on revue is good enough. at this price point revue seems better choice than roku2 xs. Any suggestions?